Plant a tree in memory of Carolyn M.
Be the first to share your favorite memory, photo or story of Carolyn M.. This memorial page is dedicated for family, friends and future generations to celebrate the life of their loved one. 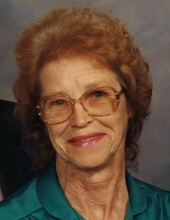 Carolyn M. Crubel, age 85 of Bloomington, WI, passed away Sunday March 31, 2019 at Agrace Hospice Care in Fitchburg, WI. She was born February 1, 1934 the daughter of Leroy and Marie (Hampton) Esser. Carolyn graduated Bloomington High School. On April 24, 1952 Carolyn was united into marriage to Harold P. Crubel at St. Mary's Catholic Church in Glen Haven. Together they farmed in Patch Grove Township. Carolyn was a faithful member and past president of the Christian Mothers, and St. Mary's Catholic Church in Bloomington. She enjoyed knitting, crocheting, gardening, and baking. Carolyn wrote poetry and had a great sense of humor when it came to her grandchildren. Surviving is a son, Steve (Dale) Crubel; a daughter, Cindy (Allen Gosdeck) Hoffman; six grandchildren: Mike (Julia), Tom (Andrea), Steven (Bri), Rob (Ashley) Crubel, Maria (fiance' Andre' Small) and Jeff (Stephanie Schmid) Hoffman; 12 great-grandchildren: Sage, Rose, Cole, Braden, Mallory, Lilly, Mason, Brody, Brooklyn, Braelyn, Bronson, and Kai-Andre'; three sisters: Barbara Langford, Selma "Sally" Champion, and Marsha (Larry) Nunn; her brother, Alex Esser; many nieces and nephews. In addition to her loving husband, Harold, Carolyn was preceded in death by an infant son, Philip; siblings: Gordon, Joseph and Mary in infancy, Mark (Myrna), Jack (Patricia), Ricky; two brothers-in-law: Art Langford and Bob Champion; and a sister-in-law, Ansy Esser. Funeral services will be held at 11:00 a.m. on Saturday, April 6, 2019 at St. Mary's Catholic Church in Bloomington with Fr. John Meinholz officiating. Burial will be in St. Mary's Cemetery, Bloomington. Family and friends may call on Saturday, April 6, 2019 from 8:30 a.m. until time of service at the church. In lieu of plants and flowers, a Carolyn M. Crubel Memorial Fund has been established. The Martin Schwartz Funeral Home & Crematory in Bloomington is assisting the family. To plant a tree in memory of Carolyn M. Crubel, please visit our Tribute Store. "Email Address" would like to share the life celebration of Carolyn M. Crubel. Click on the "link" to go to share a favorite memory or leave a condolence message for the family.